Plant growth is regulated by developmental programmes that can be modified by environmental cues acting through endogenous signaling molecules including plant hormones. This volume provides an overview of the biosynthesis, catabolism, perception and signal transduction of the individual hormone classes, followed by chapters on hormone distribution and transport, and the roles of hormone signaling in specific developmental processes. Particular attention is paid to the regulation of hormone signaling by environmental and developmental cues, sites of hormone metabolism and action, and interactions between hormone signaling pathways. The book is directed at researchers and professionals in plant biochemistry and molecular biology. Professor Peter Hedden and Dr Stephen Thomas, both Crop Performance and Improvement Division, Rothamsted Research, Harpenden, UK. 1. Abscisic acid synthesis, metabolism and signal transduction (Annie Marion-Poll and Jeffrey Leung). 2. Auxin metabolism and signaling (Jerry D. Cohen and William M. Gray). 3. Integration of brassinosteroid biosyntheis and signaling (Miklos Szekeres and Gerard J. Bishop). 4. Cytokinin metabolism and signal transduction (Alexander Heyl, Tomas Werner and Thomas Schmulling). 5. Ethylene biosynthesis and signaling: a puzzle yet to be completed (Filip Vandenbussche, Wim H. Vriezen and Dominique Van Der Straeten). 6. Gibberellin metabolism and signal transduction (Stephen G. Thomas and Peter Hedden). 7. Oxylipins: biosynthesis, signal transduction and action (Claus Wasternack). 8. Salicylic acid (Christophe Garcion and Jean-Pierre Metraux). 9. Hormone distribution and transport (John J. Ross, Gregory M. Symons, Lindy Abas, James B. Reid and Christian Lusching). 10. Reproductive development (Miguel A. Blazquez and Jose Leon). 11. Seed development and germination (Shinjiro Yamaguchi and Eiji Nambara). "This timely, highly relevant book reviews recent progress in our understanding of hormone synthesis, perception and action in plants...the book includes chapters that cover the developmental processes regulated by hormones in plants. In this regard, the text provides a comprehensive overview of hormone biology in plants from hormone perception to cellular and organismal hormone responses. In addition to reviewing the most recent knowledge about hormone synthesis, perception and signalling, this volume reviews past and current findings about hormone action. 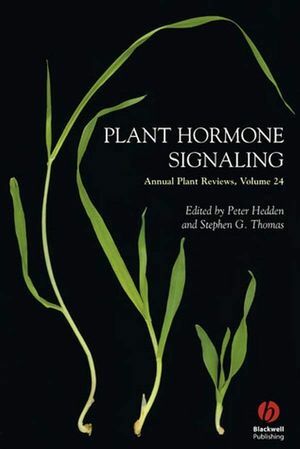 'Plant Hormone Signalling' concludes with an extensive index that adds significantly to the usefulness of this volume as a reference text for researchers and professionals tom whom the book is targeted. In summary, this volume compiles the latest information on plant hormone signalling from hormone synthesis to action. The abundant details incorporated about components in plants with hormonal functions from classic to recently identified molecules results in a noteworthy text that will be a rich resource for plant biologists for years to come." Beronda L. Montgomery in Plant Science Bulletin, Volume 53, Issue 2, July-August 2007.